The holidays bring back memories; or maybe it is simply sentimentality mixed with senility. Whatever, during the holidays my mind often wonders back to the simple foods from my childhood: creamed beef or sausage gravy on my mother’s homemade biscuits, peanut butter mixed with Caro syrup and spread liberally over plain white store bought bread and, my all-time favorite, fluffy pancakes served with fried eggs for supper. To this day I am unsure why pancakes tasted so much better when mother made them for supper than they did when she made them for breakfast. Perhaps it was the idea of breaking some rule. Or maybe it was the scent, vision and taste penetrating the chill of a winter night; the savory soft burnt smell of the batter sizzling in the skillet, the bubbles rising and bursting on top as the cakes formed and the sweetness of the syrup poured over the toast colored circles. I still get the urge to have pancakes for supper on occasion and they taste just as good now as they did back when. The problem for the single cook is that you cannot make just one pancake, or at least not just one scrumptious pancake. Why would anyone want to? I simply stir up a batch, fry them up, eat what I want and freeze the rest. To freeze, lay the cooked pancakes on a parchment-paper lined cookie sheet and set in the freeze 15-20 minutes. Once the pancakes are frozen, place them in a re-sealable freezer bag and store in the freezer for up to a month. To serve, remove individual pancakes from the freezer bag and microwave on high until thawed and hot, approximately one minute for one pancake. The lemon gives the recipe below a subtle freshness and the blueberries add a bit of sweet tartness. Sprinkle on some powdered sugar or pour on some syrup and serve. A fried egg on top is optional, but it is not really a true pancake supper without one. 1. Zest and juice one lemon. Stir lemon juice and zest into milk. Lightly whisk egg and add to bowl along with the oil. Mix well. 2. Whisk the dry ingredients together. If using frozen blueberries, coat the blueberries with a tablespoon of the flour mixture. 3. Gently stir the milk mixture into the flour mixture leaving a few lumps. 4. Fold the blueberries into the batter and place in the refrigerator for 30-45 minutes. 5. Lightly oil a large skillet and heat over medium heat until hot. Working in batches, oiling the skillet between batches, pour ¼ cup of batter for each pancake onto skillet. Fry until bubbles appear, 2-3 minutes, turn and fry 2-3 minutes on second side. 6. 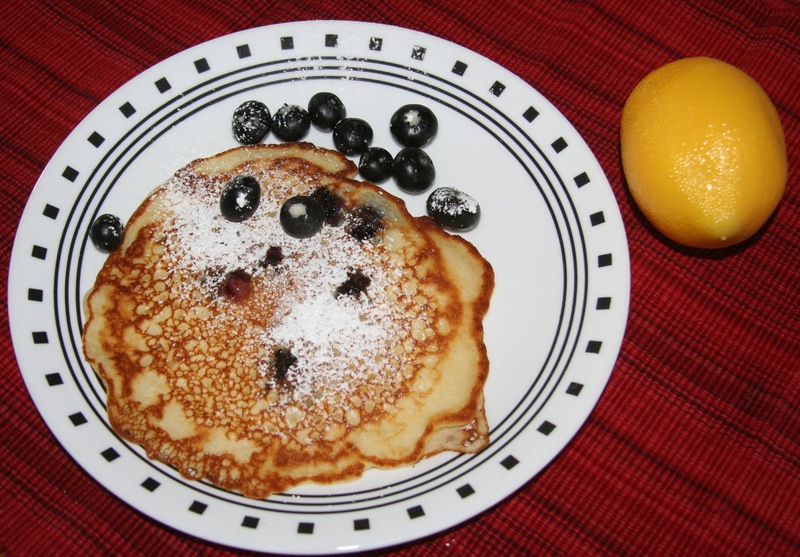 Sprinkle with powdered sugar and garnish with fresh blueberries or serve with blueberry or other flavored syrup.